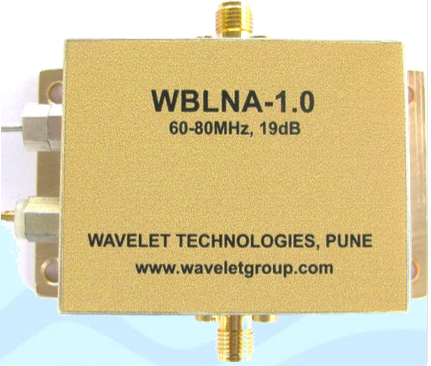 WBLNA-1.0 is a Low Noise Amplifier PCB placed inside a passivated enclosure providing a gain of 19.5 dB within the frequency range of 60- 80 MHz. It has an exceptional performance of low noise figure, high gain, high OIP3, and low bias current. WBLNA module can be used in infrastructure equipment of the mobile wireless (CDMA, GSM, PCS, GPS, PHS, WLAN, WCDMA, DMB, WiBro, WiMAX), CATV, satellite communication terminal, and other applications requiring high linearity and/or low noise figure and low bias current.